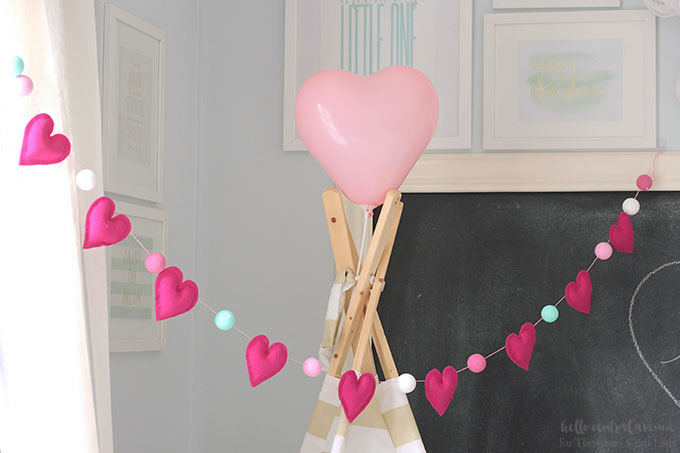 Spread the love with this easy and colorful DIY Heart Garland for Valentine’s Day. 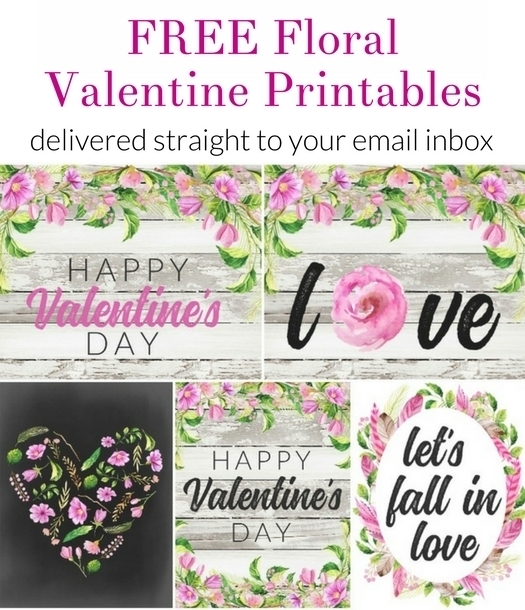 It’s a sweet little way to show a little love in your home! Hello everyone! I’m new around here, so I’d like to introduce myself. I’m Becca, and I blog over at Hello Central Avenue. 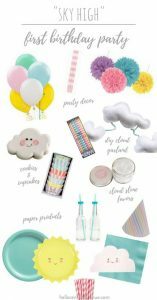 I write about creating projects, hosting parties, and making a home full of pretty spaces! I am so happy to be guest posting today on The Crazy Craft Lady! I’ve always loved Valentine’s Day. Yep. I’m one of those people. I like it even more after having kids! One specific reason is because my son was born on Valentine’s Day! Cue the heart eyes! I like to make Valentine’s Day even more special because it’s also his birthday. One way I’ve done this is by going all out on Valentine’s Day decor. 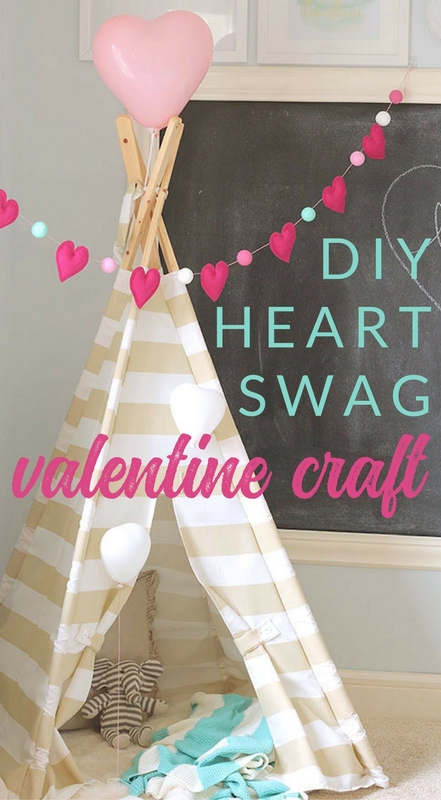 This year I’ve made a colorful heart garland, among other fun Valentine’s Day decor! 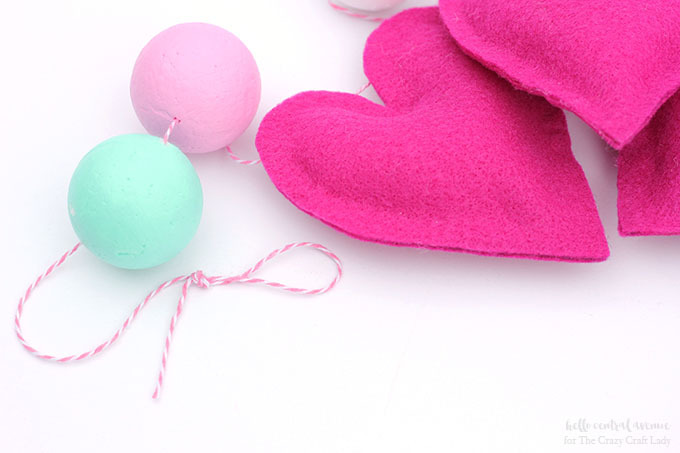 The heart garland is made with painted styrofoam balls, felt hearts, and baker’s twine. It’s super easy, but packs a big punch of love! 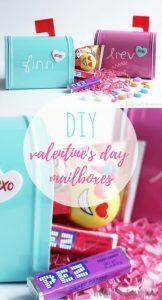 If you like this Valentine’s Day project, you’ll want to check out my “Valentine’s Day Letterboard” complete with giant googly eyes! 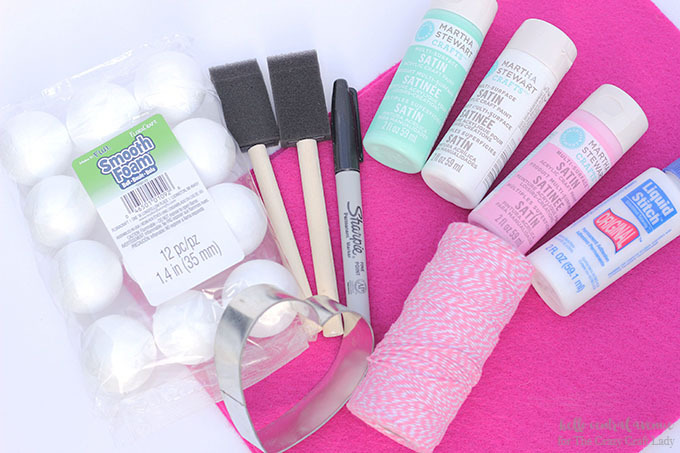 Paint the styrofoam balls in coordinating colors or any colors that you like! I chose light pink, aqua, magenta, and white. These are slightly untraditional for Valentine’s Day colors, but I like it when things are a little unexpected! I used three coats of paint to cover the balls in the heart garland. Depending on the paint you use, you might need more or less. 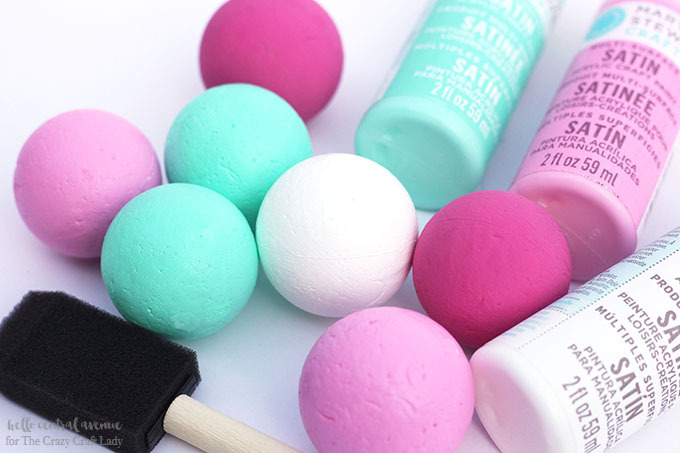 While the balls are drying, you can start the next step! Stack two pieces of felt. 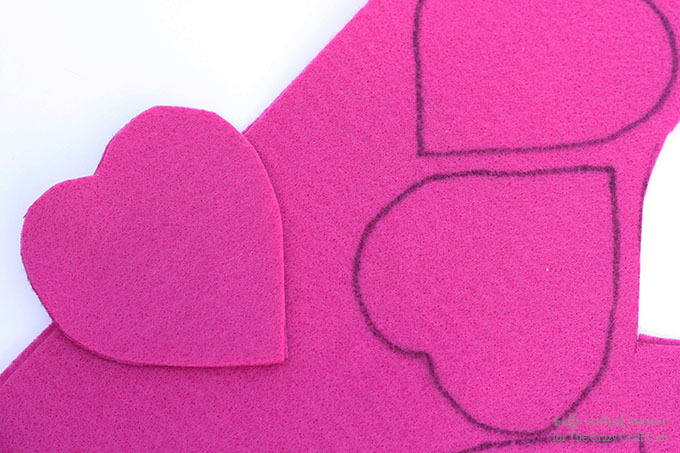 Draw the heart shape on your felt and cut out the hearts. I used a cookie cutter to trace my hearts. You also could use a stencil, print a heart off the internet, or if you are really feeling crafty, you could draw one yourself! I made all of my hearts magenta since the styrofoam balls were different colors, but you can choose any color! 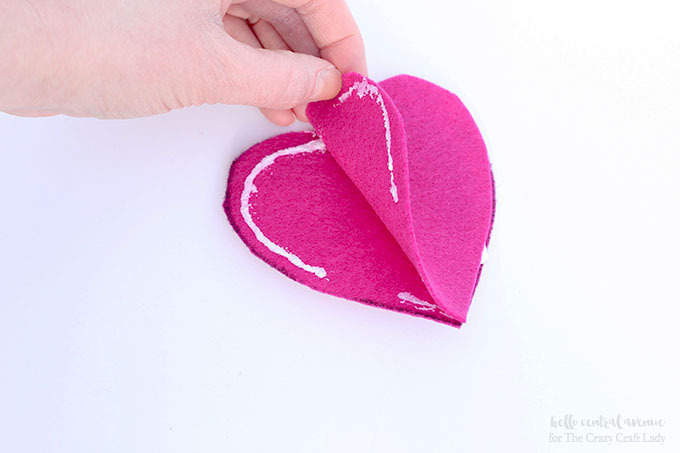 Use your fabric glue (or liquid stitch) to glue your two heart pieces together. Make sure to leave a small opening so that you can fill your heart with stuffing! You can see in the image below where I left a little opening for the Polyfill. Set your hearts aside to let dry. 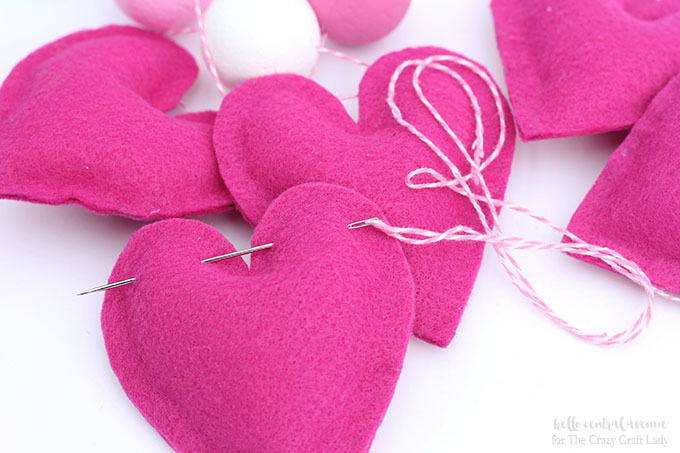 After the glue is dry, you can begin filing the hearts with stuffing. Be sure to work the stuffing into all the little nooks. You can use your finger, a pencil, the end of a paintbrush, or anything that will fit inside the heart. You can decide how much stuffing to put inside. 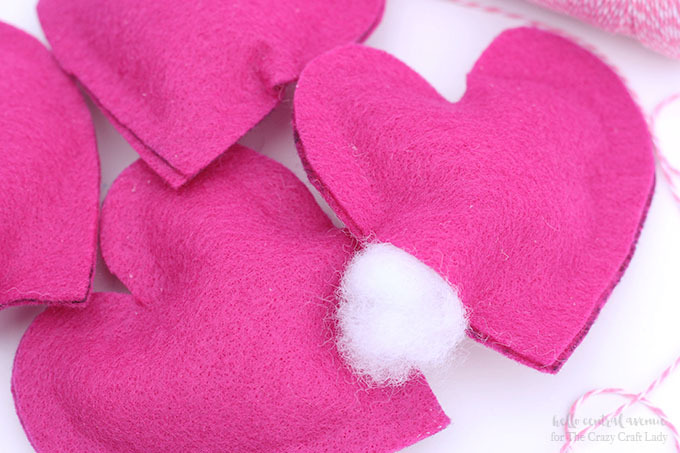 When you are finished stuffing the hearts, you will use your glue gun to close the opening. If there are any other places that opened up, use the glue gun to secure these spots as well. Once the hot glue has dried, you can “clean up” your hearts. I trimmed the hearts into a more defined shape, and also cut off any of the black sharpie marker that was still showing. 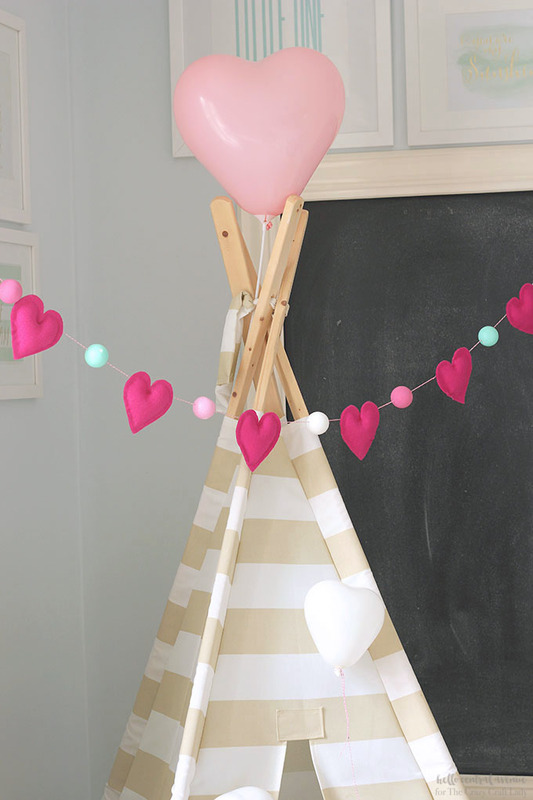 Now you can begin stringing your heart garland! First, cut a piece of baker’s twine to your desired length. I cut mine at 86 inches. Next, tie a loop on one end of the baker’s twine so that your styrofoam balls and hearts don’t fall off. I chose to put two styrofoam balls on the ends and one ball in between each heart. There are 12 balls and 9 hearts all together. Feel free to change it up! I used a large sewing needle to string the styrofoam balls and felt hearts. I threaded the needle and pushed it through the center of the styrofoam balls. If the needle gets stuck you can press it against a firm surface or use a rubber jar opener to pull it through. 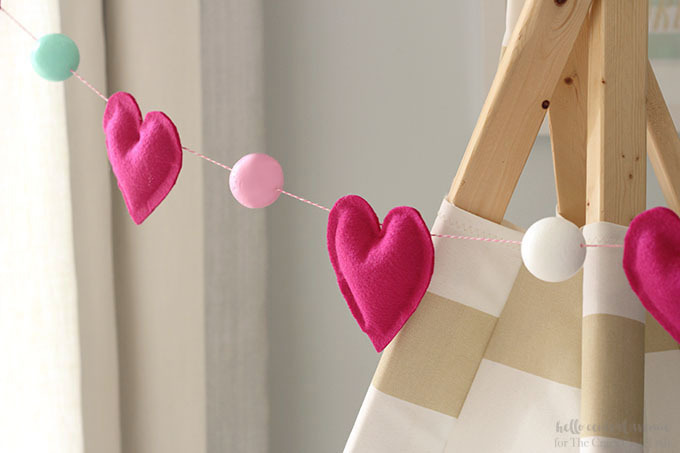 For the felt hearts to hang properly on the garland, you need to thread the baker’s twine through the top of the hearts. 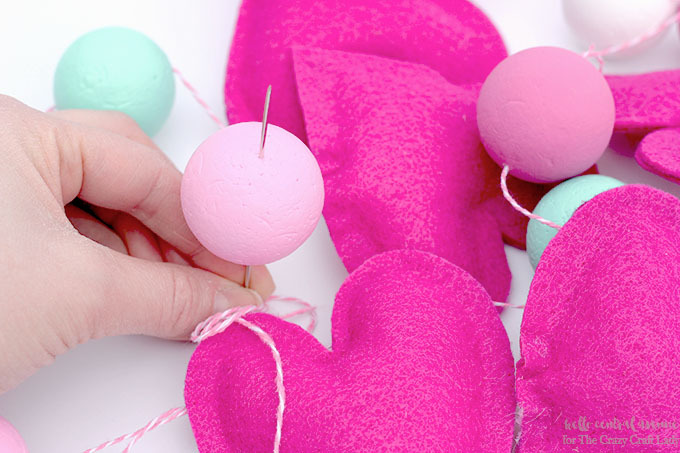 Once you finish threading your styrofoam balls and felt hearts through baker’s twine, you can tie off another loop to complete your heart garland! 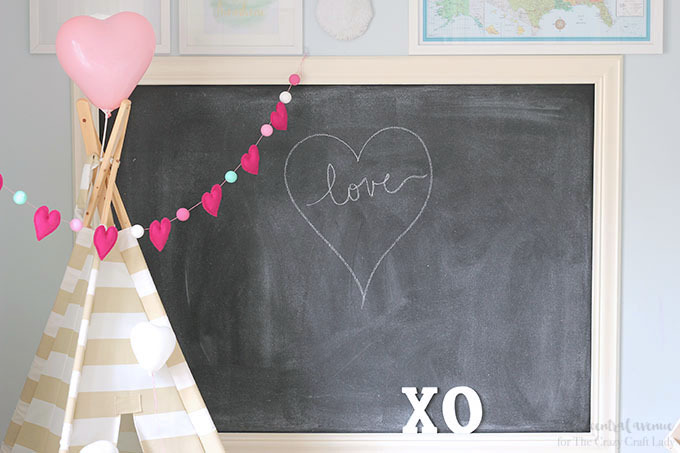 You could even make this heart garland with your kids! You could let them pick out the paint and felt colors. 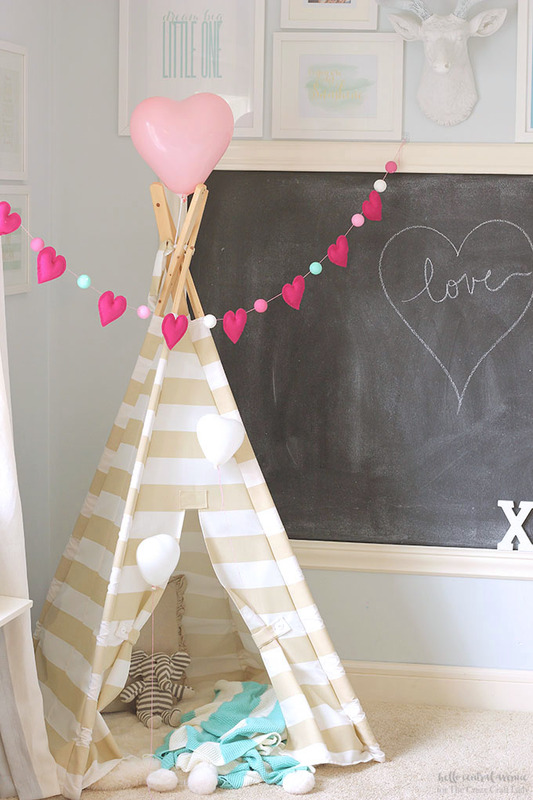 This garland is perfect to hang anywhere! Add it to your Valentine’s Day mantle or find another sweet little spot around your house. Have a happy Valentine’s Day!